The European Centre for Environment and Health (ECEH), established in 1991, operates as a centre of scientific excellence of WHO/Europe, providing Member States with state-of-the-art evidence on the nature and magnitude of existing and emerging environmental health risks, and assisting them in identifying and implementing policies to address these risks. 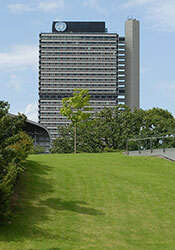 ECEH is part of the WHO Regional Office for Europe and is located in Bonn, Germany. It develops policy advice and international guidelines, such as those on air quality and noise, to inform and support decision-making by governments, health professionals, citizens and other stakeholders. ECEH supports the European process on environment and health, initiated by WHO/Europe in 1989. Current activities focus on follow-up to the Fifth Ministerial Conference on Environment and Health, held in Parma, Italy, in 2010. Following the closure of the Rome office in 2011, the Bonn office expanded its scope in 2012 thanks to additional support from the German Government, and currently covers a broad range of environment and health topics.